Witch’s Rock, the wave from which we derive our namesake, popularized by The Endless Summer II most definitely lives up to the hype. If you’ve seen the movie, you know what this wave can do during a swell. Simply put, it’s a leg burning barrel. Witch’s Rock handles swell very well, it gets big, and it gets hollow. What’s not to love? Witch’s Rock is located off Playa Naranjo in North West Guanacaste. Playa Naranjo is part of Santa Rosa National Park, which means it’s not exactly right off the road. In fact, access by the road is strictly limited, unless you have a 4×4 that can handle some serious mud and you’re planning on camping out. Your best bet is to access the wave by boat. Of course, WRSC provides boat trips to this dreamlike wave! Witch’s Rock is a world class beach break that is formed by the estuary’s sand deposits, which create a flat, long, sandbar. 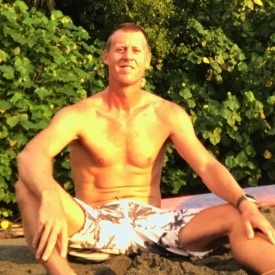 This sandbar allows for long lefts, rights, and few closeouts. 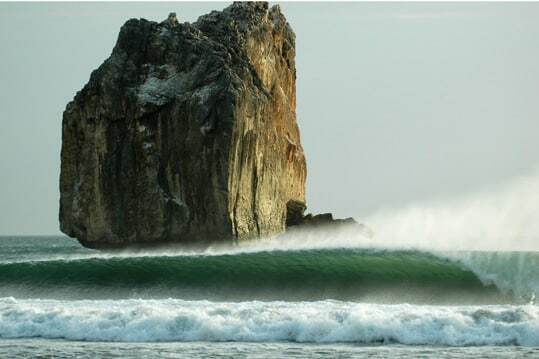 The rock itself, named Roca Bruja, meaning witch’s rock, provides a scenic backdrop for flawless waves. Unlike many world-class beach breaks, such as Ocean Beach, Hossegor, or Puerto Escondido, Witch’s Rock is a fairly easy, playful wave. Ollie’s point is named after former US Colonel Oliver North, because of its proximity to an old top-secret CIA airstrip, where the US would supply Nicaragua contra fighters with weapons, allegedly. Also featured in The Endless Summer II, Ollie’s point offers long right-handers that will make your trip well worth it. Located even deeper into Santa Rosa National Park than Witch’s Rock, driving is not recommended. Fortunately for you, WRSC also runs boat trips to Ollie’s Point! On a solid south swell, Ollie’s point will light up. The wave itself is a right-hand point break with a combination of sand and cobblestone. The wave walls up quite nicely providing great sections for big turns and barrel sections at low tide. So, what are you waiting for? Book your ticket and you’ll be scoring on these world-class waves in no time! Previous PostHow Does Your Workout Stack Up? Test It Here!